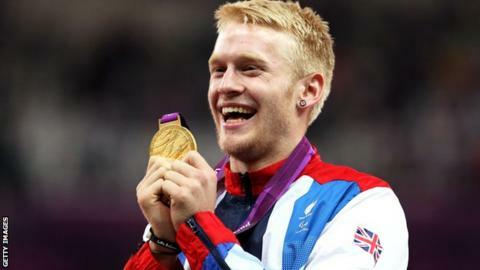 Paralympics 100m champion Jonnie Peacock has played down his chances of competing at the 2016 Olympics in Rio. Peacock won the T44 title in 10.90 secs but believes taking on the world's best able-bodied athletes is unrealistic. "The first 40 [metres] is going to be too slow and there's not enough time to make it back up," the 19-year-old told BBC Radio Cambridgeshire. "Never say never, but it would be a lot harder because of the disadvantage at the start." South African runner Oscar Pistorius, who finished fourth behind Peacock on Thursday evening, made history at the recent London Olympics by taking part in the 400m. "Oscar's got a 200m disadvantage at the start, but in the 100m, you don't have another 200m at the end of the race to make it up," Peacock said. The teenager's winning time was a new Paralympics record, but he said he could not believe it when none of his rivals appeared at his shoulder in the closing stages of the race. "I got up to 60, I knew I was probably going to be in the lead by then and I was thinking: 'Please don't, Oscar. Please don't'. "I've seen it so many times on YouTube, him just going past someone. That's why, right at the end, I started to rock a little bit because I started to tense up. "I was waiting for it. I knew that somebody was going to be coming but luckily they didn't and I managed to hold everyone off," he said. Peacock, who lost his right leg below the knee after contracting meningococcal septicaemia at the age of five, admitted he found the atmosphere inside the Olympic Stadium overwhelming. "I knew the crowd were going to be immense with Dave Weir going just minutes before me. I knew he was going to win and the crowd would be on a massive high from that. "I was prepared for a lot of noise but I didn't quite expect to get as much as I got and the chanting [of my name] was absolutely amazing. It was surreal and I don't think anything is ever going to come close again."